Please note: The embargo on this press release was lifted ahead of schedule. A publication-quality graphic is available here. WEST LAFAYETTE, Ind. - The most comprehensive climate model to date of the continental United States predicts more extreme temperatures throughout the country and more extreme precipitation along the Gulf Coast, in the Pacific Northwest and east of the Mississippi. The climate model, run on supercomputers at Purdue University, takes into account a large number of factors that have been incompletely incorporated in past studies, such as the effects of snow reflecting solar energy back into space and of high mountain ranges blocking weather fronts from traveling across them, said Noah S. Diffenbaugh, the team's lead scientist. Diffenbaugh said a better understanding of these factors - coupled with a more powerful computer system on which to run the analysis - allowed the team to generate a far more coherent image of what weather we can expect to encounter in the continental United States for the next century. Those expectations, he said, paint a very different climate picture for most parts of the country. "This is the most detailed projection of climate change that we have for the U.S.," said Diffenbaugh, an assistant professor of earth and atmospheric sciences in Purdue's College of Science and a member of the Purdue Climate Change Research Center. "And the changes our model predicts are large enough to substantially disrupt our economy and infrastructure." The research team also includes Diffenbaugh's Purdue colleague Robert J. Trapp, as well as Jeremy S. Pal and Filippo Giorgi of the Abdus Salam International Centre for Theoretical Physics in Trieste, Italy. Their paper appears in today's (Monday, Oct. 17) online edition of the journal Proceedings of the National Academy of Sciences. Climate models are sophisticated computer codes that attempt to incorporate as many details about the complex workings of our environment as possible. Hundreds of dynamic processes, such as ocean currents, cloud formations, vegetation cover and - of particular import - the increase in atmospheric greenhouse gases, are programmed into the computers, which then attempt to discern the net effects on square-shaped plots of land that represent small pieces of the Earth's surface. The smaller these squares are, the better the resolution the model can provide. "Just as a digital camera that creates images with more pixels can result in a better photograph, we want to make those squares as small as possible," Diffenbaugh said. "We'd also like to incorporate as much of the climate system as we can so the analysis will be realistic." Despite the number-crunching power of the linked computers used for these simulations, a model must factor in so many changing variables that a full analysis can require months of nonstop computational effort. Diffenbaugh's team required five months to run their model on a cluster of Sun computers at the Rosen Center for Advanced Computing on Purdue's campus. "The results were worth it, though, because this model allows us to project changes in climate with unprecedented resolution," Diffenbaugh said. Until now, the fastest computers have been used to resolve squares 50 kilometers to a side, which can return a reasonably accurate but rather grainy "photograph" of climate change. "We can now analyze areas that are only 25 kilometers to a side, which, for example, allows us to discern more clearly where California's central valley stops and the Sierra Nevada mountain range begins." With their improvements over previous models, the team has been able to make several observations about the change in climate over the next century, particularly for the late century when greenhouse gas accumulation could have greater effect than, say, a decade from now. "These projections are not necessarily about specific weather events," Diffenbaugh said. "But they do give us a good idea about what kind of weather to expect over the long run in a particular part of the country." The desert Southwest will experience more heat waves of greater intensity, combined with less summer precipitation. Water is already at a premium in the four-corners states and southern Nevada and, as years pass, even less water will be available for the region's burgeoning populations, with extreme hot events increasing in frequency by as much as 500 percent. In the northeastern United States - roughly the region east of Illinois and north of Kentucky - summers will be longer and hotter. "Imagine the weather during the hottest two weeks of the year," Diffenbaugh said. "The area could experience temperatures in that range lasting for periods of up to two months by century's end." Similarly, the continental United States will experience an overall warming trend: Temperatures now experienced during the coldest two weeks of the year will be a past memory, and winter's length will diminish as well, according to the model. "We checked our model's performance by analyzing the period from 1961 to 1985 for which, of course, we do not need a prediction," Diffenbaugh said. "The model performed admirably, which tells us we've got a good understanding of how to represent the physical world in terms of computer code. It's certainly not perfect, but we'll need a computer at least 100 times as powerful as the cluster we used to really improve the accuracy. We would like to have access to such computing power in the future." "The more detail we look at with these models, the more dramatic the climate's response is," he said. "Critics have complained that climate models lack sufficient spatial detail to be trusted. In terms of looking at the whole contiguous United States, we've quadrupled the spatial detail and, as a result, it appears that climate change is going to be even more dramatic than we previously thought. Of course, we can never be completely certain of the future, but it's clear that as we consider more and more detail, the picture of future climate change becomes more and more severe." Commenting on the study, Stanford University's Stephen H. Schneider said the results confirm scientists' suspicions about the future of climate change. "This study is the latest and most detailed simulation of climatic change in the United States," said Schneider, who is Stanford's Melvin and Joan Lane Professor for Interdisciplinary Environmental Studies. "Critics have asserted that the coarse resolution of previous studies made their sometimes dire predictions suspect, but this new result with a very high resolution grid over the United States shows potential climatic impacts at least as significant as previous results with lower resolution model. As the authors wisely note, such potential impacts certainly should not be glibly dismissed." This research was funded in part by a grant from the National Science Foundation. The Rosen Center for Advanced Computing is a research computing center named in memory of Saul Rosen, who served as director of Purdue's Computing Center from 1968-87 and who helped to establish Purdue as a pioneering academic institution in high-performance computing. The Rosen Center is a part of Information Technology at Purdue, which is responsible for planning and coordinating the central computing and telecommunications systems on the West Lafayette campus. We find that extreme temperature and precipitation events are likely to respond substantially to anthropogenically enhanced greenhouse forcing, and that fine-scale climate system modifiers are likely to play a critical role in the net response. At present, such events impact a wide variety of natural and human systems, and future changes in their frequency and/or magnitude could have dramatic ecological, economic and sociological consequences. Our results indicate that fine-scale snow albedo effects influence the response of both hot and cold events and that peak increases in extreme hot events are amplified by surface moisture feedbacks. Likewise, we find that extreme precipitation is enhanced on the lee side of rain shadows and over coastal areas dominated by convective precipitation. 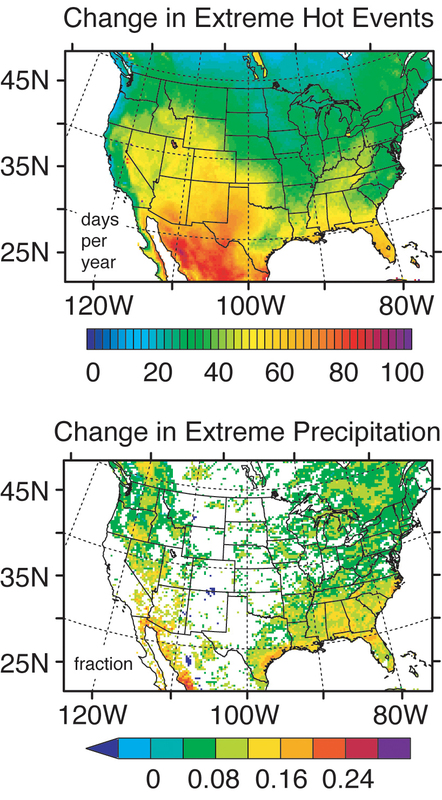 We project substantial, spatially heterogeneous increases in both hot and wet events over the contiguous United States by the end of the next century, suggesting that consideration of fine-scale processes is critical for accurate assessment of local- and regional-scale vulnerability to climate change.